We have teamed up with Nova Music and Mayfly Wine Co. to create a magical dining experience at Standon Calling. 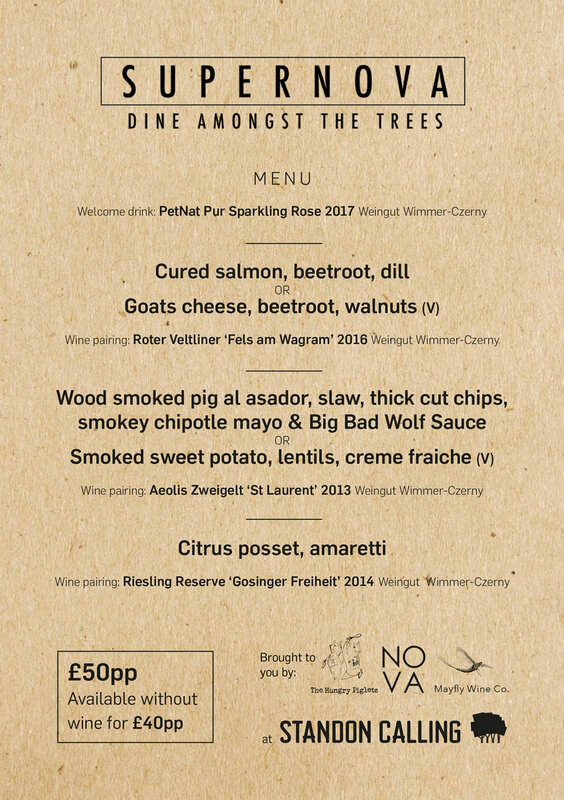 Enjoy a three course sit-down meal with perfectly-paired wines, live music and DJs in an atmospheric woodland setting for £50pp (+bfs), or with non-alcoholic drink options for £40pp (+bfs). Lunch and dinner sittings are available Friday 27th, Saturday 28th and Sunday 29th July. Thursday 26th July has already sold out! See the full, delicious menu below. We are so very excited to be serving at Wilderness this year. 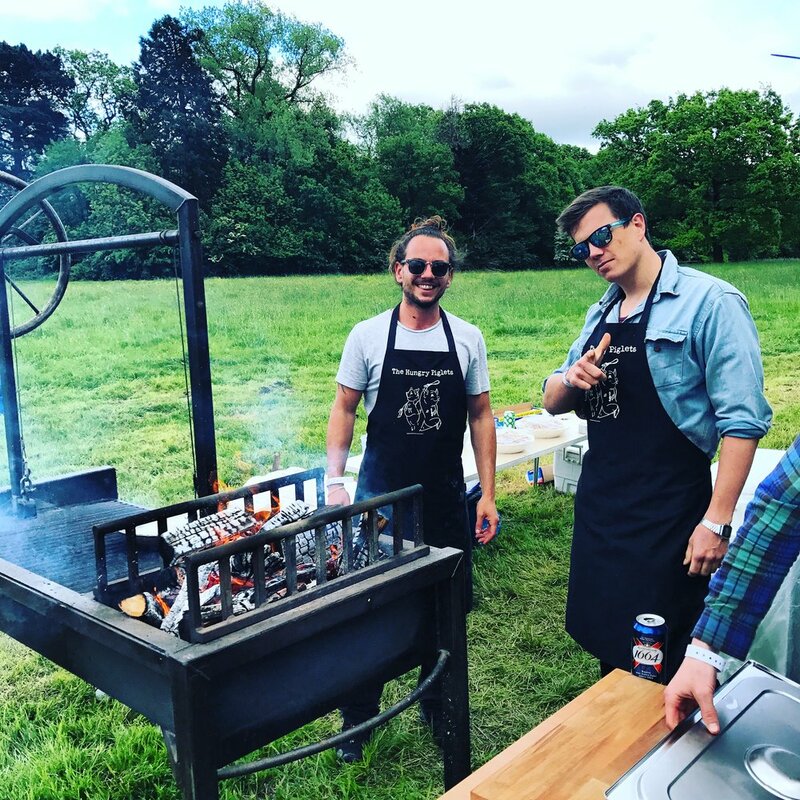 Look out for our newly built stall where we will be serving up our very best dishes including our famous slow cooked ribs finished on a wood fire. All served with our very best zingy slaw and Big Bad Wolf sauce! Getting excited for the start of the summer? We certainly are and The Hungry Piglets are going to hit it with a bang with some open fire spit cooking @ the awesome Cherryfields festival on Saturday 20th May. We will be smoking whole lamb on an open fire for 8 hours.....tempted?!! The Hungry Piglets are heading east this Christmas and taking over a fantastic venue, Palm 2 in Clapton. We have the most delicious menu to serve you and once you have filled your boots Jolyon Klean will be taking to the stage and keeping you dancing long into the night. Need we say more? It’s that time of year again and we are delighted to invite you to come and enjoy our new exciting menu. This year we will be raising money for Vera School in South Africa. An underprivileged school for Autistic children, which is close to our hearts. Pop up restaurant, raising money for Mencap. This year’s event will be held at a bigger and better venue Brixton East 1871. The evening will commence @ 7:30pm until late. This year we will be hitting Christmas with a bang, with a secret menu in store and some festive entertainment. Your ticket will include a free drink on arrival before sitting down for a three course meal.